Did dinosaurs have binocular vision similar to humans? But some scientists believe there were exceptions, and some dinosaurs may have had binocular vision similar to a human’s depth perception. In particular, predators such as the Tyrannosaurus may have been able to see depth, suggesting that the animals were hunters, not scavengers as some paleontologists believe. In addition, over time some carnivores may have evolved facial traits that actually enhanced the animals’ ability to see in depth. And some dinosaurs may have developed sight similar to a hawk, a raptor that can see its prey from far away, but whose binocular vision does not kick in until it swoops down to nab its prey. More work is being done by scientists to determine how dinosaurs saw the world by using model dinosaur heads and laser beams to ascertain sight position. Some hunting dinosaurs probably had binocular vision, just like today’s predators. 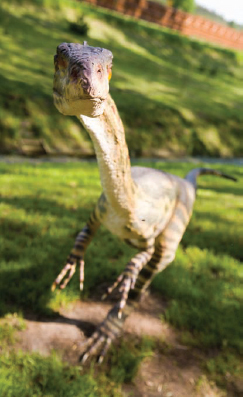 Not all did, though, like this Coelophysis Bauri, which was a predator but had eyes better situated for peripheral vision (Big Stock Photo).